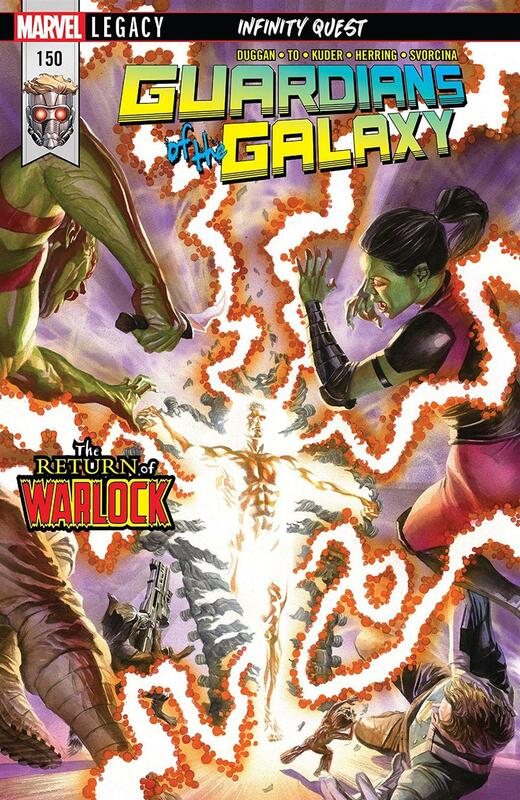 Adam Warlock is back! Hooray, right? Well, let's not hang a "welcome home" banner on the Milano's bridge just yet. Though this issue sports extra pages - and an accompanying price bump - it hasn't got time to answer all (or really any) of your Warlock questions. The good news? Tucked between Adam's two scenes you'll find a pretty excellent Guardians comic, and faithful readers should be more than satisfied with this action-packed pivot into the upcoming madness of the Infinity Countdown. #149 primed us for a massive Nova Corps vs. Raptor fight, and this issue absolutely delivers. Most awesomely, Scott Lang gets a badly-needed win in the big space battle. It's a clever (Gimmicky? Nah, clever!) new use of his powers. Rocket is quick to steal credit, but he's also impressed - and readers will be, too. Richard Rider misses the big fight, but he shows up for the finale and Gerry Duggan is plotting the longer story to bring him face-to-face with his now-evil-ish brother very soon. And yes, Rich will be front and centre with the Guardians going forward. There's a surprise departure as well, but it's not the one you might be expecting if you're following Countdown news. Besides the last of the Raptors and a bunch of Infinity Stones, the Guardians still have to deal with the Gardener and his evil Groots, cosmic Ultron, and a rapidly-inflating rogues' gallery that includes Skrulls, Chitauri, and possibly even Thanos. (What am I saying, "possibly?" We're headed into an Infinity Stones event! Of course Big T will be in the mix!) Plus Adam meets a bonus villain I dare not name here. The script serves up plenty of excitement and humour, including a welcome dig at MCU synergy. ("I thought the Reality Stone was purple?" "Not anymore, apparently.") Gerry Duggan's writing isn't flawless. A key piece of early Drax dialogue crosses the line from in-character bluntness to unintentional stupidity. Fortunately, Drax gets plenty of focus further into the issue and those more critical moments are written with greater care. Marcus To delivers a visual feast, putting an impressive capstone on his industrious months on the one-man double-shipping grind. His previous work was sometimes rushed, but here he lavishes some very detectable and very appreciated extra effort on the climactic battle. Aaron Kuder is also on board, contributing dreamy vistas to the first Adam Warlock scene. (Also perhaps he's responsible for Adam's swank new design?) Ian Herring's colour work adds a great deal of depth and texture here, though in the later space battle sequence his colours get just a bit drab. If your sole interest in this story is in seeing Adam Warlock resurrected, you may be disappointed. Alex Ross's gorgeous cover doesn't just feel Silver Age-y, it also lies like a Silver Age cover. There is no Warlock/Guardians meet up. Warlock frames this issue front and back, but his scenes do not connect to the core Guardians story and the role he'll play in the coming event is still quite opaque. If nothing less than full-on Warlock action will satisfy you, save your shekels for next month's Infinity Countdown: Adam Warlock one-shot. If, however, you're not just in it for the Warlock, this issue should do an admirable job of pumping you up for Infinity Countdown. It manages to polish off the Guardians' current series in flashy, satisfying style while also whetting your appetite for the event to come. Marvel's cosmic arena is looking wilder and more exciting than ever, and though it will continue under other titles, the Guardians' story is still well worth following.